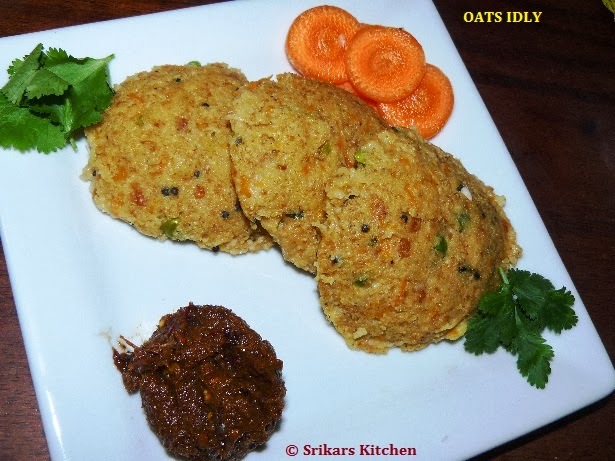 Oats Idly- It is very easy to make & a healthy breakfast.I used wheat rawa which is more healthier than plain rawa. Dry roast the oats & make a course powder. Dry roast the wheat rawa &allow it to cool. Heat oil in a pan, add mustard seed, g.chilles,ginger, grated carrot & allow to sauté. Take a bowl add oats, wheat rawa, yoghurt, sautéed carrot, salt & mix well. If water needed, add little water & make a runny batter .Take a idly plate, grease it & add the bater . Steam it around 10 mins & serve with chutneys or Pickles. wow such an healthy and yummy idli :) looks very soft and tempting !! Perfect for kids...... Healthy and tasty idli!! Wow this looks super healthy and easy. Now that my dad is here i have to think of something every day for his dinner. I am bookmarking this one.